Hard on the heels of the release earlier this week of Firefox 8, Mozilla on Thursday released the beta versions of the next Firefox in line. The Android version, meanwhile, offers “a completely new experience optimized for tablets that makes mobile browsing more intuitive,” in the project's own words. Though not intended for production use, the new beta versions are now available for free download from the Future of Firefox site. Here's a look at some of the features you'll find. Also new in the desktop beta version of Firefox 9 is Mac OS X Lion support. With a look that matches the Mac OS X Lion application toolbar and icon styles, Firefox 9 beta supports the two-finger swipe for navigation and better accommodates users with multiple monitors. New features for developers, meanwhile, aid in the creation of faster websites and Web apps as well as allowing developers to see when users have enabled Firefox's Do Not Track privacy feature. On the mobile side, the Android beta version of Firefox 9--displayed below--is optimized for tablets with a raft of new features for users and developers. 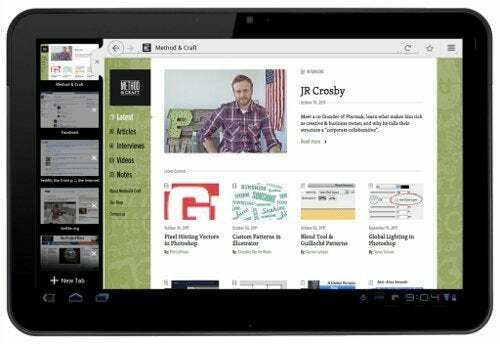 The browser now leverages tablets' larger screen size, for example, allowing users to make use of the full screen when browsing, even while working in portrait mode. Among the Firefox features now optimized for tablets are tabs and the Awesome Screen. Tabs, for instance, are displayed as thumbnails in the left panel of the browser, allowing users to switch among them easily while still viewing full websites on the right. By swiping to the left, tabs can be quickly hidden for a full-screen view. A new Action Bar, meanwhile, gives users quick access to Firefox Preferences, Add-ons, downloads, and more, with back, forward, and bookmark buttons for easy access. Finally, new features for developers in the Android version include an HTML5 input tag for camera access and support for the HTML5 Form Validation API. Firefox 9 is due for final release on Dec. 20. Still in the works for future versions, of course, are a native interface for Firefox for Android and a significantly reduced memory footprint. In the meantime, though, these new betas could be fun to test out for an early taste of what's to come.